Now that you know what size you are currently at, you can buy some jewelry in the next size up to start the stretching process! There is a wide range of body jewelry to choose from, but certain plugs are better for stretching and healing than others. You should only stretch with plugs made from smooth, nonporous materials. Look for steel, titanium, niobium, glass, or Pyrex jewelry to use in your fresh stretches and while healing. Most other materials are porous and will hold and spread bacteria, which can quickly lead to infections. Additionally, you should only use single-flared or nonflared plugs to stretch with. Double-flared plugs are not recommended when stretching because the ear has to go more than one size up to go over the flared ends. If you’ve been at your current size for a very long time, it may be safe to pop in your new jewelry without any additional materials. This is called dead stretching, and it is only recommended when your piercings are beyond healed at their current size. In all other cases, you should use the tapering method to stretch your ears. The tapering method is a safe method of stretching because the tissue is stretched cleanly, evenly, and smoothly. A taper is bar that is smaller on one said than like a cone. 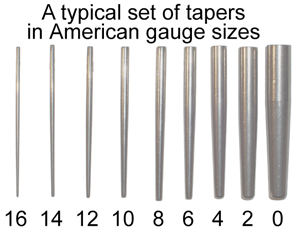 Buy a taper in the size of the jewelry you are going to stretch to -- long, straight, steel tapers are preferred, but any taper is better than none. You can use one taper to stretch multiple piercings, and we recommend that tapers don’t be worn as jewelry (although some of them are very pretty!). The shape and off-balanced weight of a taper aren’t meant for long-term wear. Oils can also be used to help get the taper through and your new jewelry in. Jojoba and emu oil are two types of oils that are excellent for this type of application. Ear stretching balms and creams or any type of water-based lubricant would also be suitable. However, be sure to avoid oil-based lubricants, such as petroleum jelly (Vaseline). .
Once you have the plugs, taper, and oil that you need, you’ll be ready to start stretching!